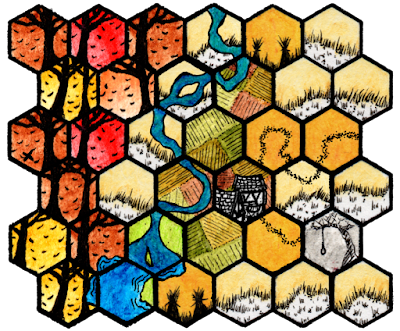 Goatman's Goblet: Hex Kit Released: I'm happy. 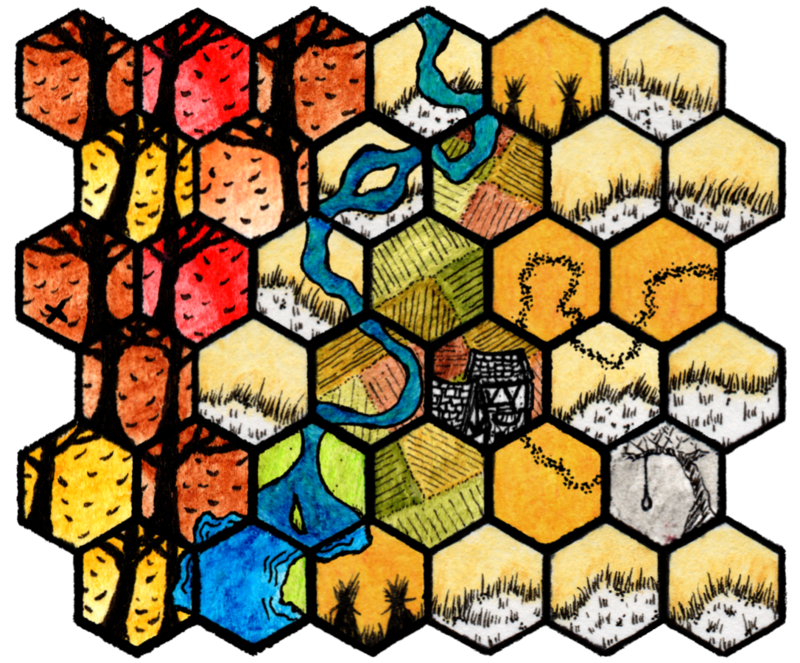 Hex Kit released, and after a pretty rough day of work I spend all of five minutes to put together a little map that is in theme of Chromatic Soup 2's Americana Frontier, though in my mind I've been referring to all my contributions to as an Autumnal Wilderness. A place of wide fields, sweeping tick-brushed hills, potter's fields and shallow graves, woods caught in eternal red-orange-yellow Fall, and hobos and chain-gangers aplenty trying to find their way. 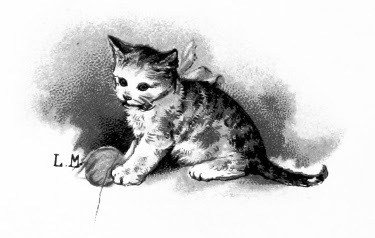 Click For a Full Size of a few minute's effort. Where little men will drink you away for forty years in the wild wood, treasure might always be buried somewhere under your nose, and civilization is as much your haven as it is your hell; as only man is cruel enough to string someone up and give them a long neck job. I look forward to, eventually, running a polite little hex crawl in that assumed setting. An Over the Garden Wall meets O Brother Where Art Thou? with all the strangeness of folklore, tall tell tale, and Swing You Sinners. As for Hex Kit itself, I like it. It works for what it is, is rather intuitive, and the hexes themselves look as good as they did when I first bought the kit back when it released. It is one of those few kickstarters I am grateful I backed; the other one really only being Roll20. If you didn't back Hex Kit, buy it. It is a solid tool, and the art is stellar. I fear it will become over-saturated, but then again it does cost money and it isn't up for commercial use. Currently: I'm working on a series of randomizers for a project. I have 240 out of 960 written out. My goal is to burn through these this weekend and see how it turns out. Next: Still more travel work. I move at the end of May, and June is essentially a month off without games or work---hopefully a lot of game writing will happen then. Edit 4/29/2017: Added links to the site to buy it at the top and bottom, kept one link as a link to the faq. None of these things are of the sort I can make money off of anyway and are meant purely for utility purposes and ease of access.